En Shi Yu Lu is an historically important, ancient tea, first produced during China’s Tang dynasty (618-907). It is unique among China’s green teas in the way it is made. Chinese tea history suggests that fresh leaf to make this tea underwent some manner of ‘steaming’ before being rolled and shaped and dried. Steaming as a distinct step in tea processing disappeared in Chinese tea manufacturing sometime after the Tang Dynasty, and has not been a part of Chinese green tea production since. But during the time that it was being utilized, Japan’s fledgling tea industry learned this method from the Chinese and adoped the practice. Today, a sophisticated variation of this early steaming step is used in the manufacture of all Japanese green teas. But for En Shi Yu Lu this change meant that the tea began to be made using newly developed Chinese green tea making techniques: fixing, rolling, shaping and firing. These steps are still used today, with some refinements over time. In the 20th century efforts were made to return to making En Shi Yu Lu with the old steam method. To do this, the fresh leaf is exposed to steam on a heat table for a short time. When the steam is turned off and the leaf cools, workers roll and shape the leaf by hand. 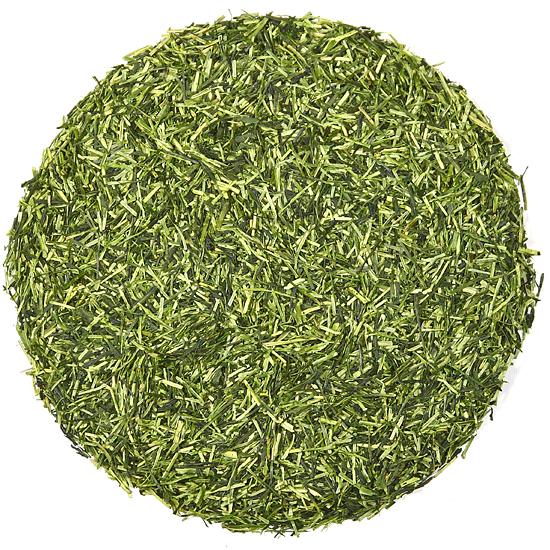 En Shi Yu Lu is one of only a few China green teas that is processed using a steaming method. Steaming fresh leaf in the tea factory adds depth of flavor and a bright vegetal quality to the tea. The flavor of En Shi Yu Lu is floral and herbaceous in the cup, and the tea has a rich body and mouth feel. En Shi Yu Lu is a delicious green tea from an area that does not produce very many green teas and certainly none as famous as this tea. Fans of our Lu Shan green tea should like this tea, too. Some say that En Shi Yu Lu is similar to Japanese sencha green tea, but in truth we feel that it is quite different in all respects from Japanese sencha. En Shi Yu Lu, despite the steaming process in its manufacture, is quite Chinese in character and appearance. This tea is made in the Wufeng mountains of southwest Hubei Province in theTujia Nationality and Miao Nationality Autonomous Prefecture, by people from the Tujia and Miao ethnicities.